Brickell City Centre held up well during Hurricane Irma and is set to reopen later today. According to Swire Properties, there was no structural damage anywhere in the complex, including residential towers, hotel, office towers, and shopping center. Electricity was maintained throughout the storm, and buildings performed as they were designed, Swire said. First to open will be the East hotel, starting Tuesday (today), September 12. Also opening tonight will be some restaurants, from 6-11pm. 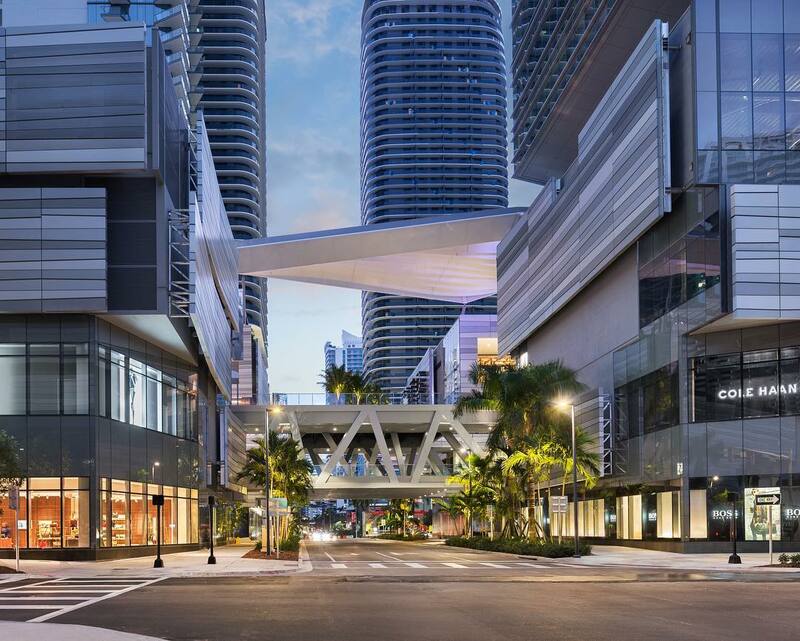 Select retail stores at Brickell City Centre’s mall will reopen Wednesday, September 13. Residents are already able to return to their condominium units, Swire said. I live in BCC reach tower no flooding, mall fine less a few trees because they never were mature enough to be rooted well. Surprised no trees I saw flew off any nearby towers penthouse units. The river surged and covered the whole triangle where river oyster bar is but BCC was unscathed. We lost power in the condo tower maybe 5 or 6 times literally just long enough to shut your computer off. The wind gusts between some towers was really nasty. So the climate ribbon passed the test with flying colors!!! If only it would properly funnel the breeze the way it was supposed to…that’s the real test and it’s been pretty sweltering during the summer. Ok people, keep your pants on and stop criticizing. I was here during Wilma when Brickell got hit with the same wind speeds and the results were completely different, back then there were a lot of buildings that lost glass panels. Since then the codes have changed and as a result the new panels did much better and we did not see the same thing happen with Irma. By the looks of it BCC and the buildings on top of it were built correctly, otherwise we would have seen glass being blown off and the climate ribbons destroyed. Give credit where credit is due. I live in Reach and we have water damage in my entire apartment line. This is the most stupid and illogical statement I have ever heard. First, there are 200+ sky scrapers in Miami. None of them found it necessary to inspect their towers for structural damage following a Cat 1 (or Cat 2) winds. These towers are built to withstand Cat 4 winds. So why this dumb statement is beyond me. Second, a structural damage or integrity inspection involves days if not weeks by a squad of engineers measuring multiple parameters. So how did this genius know the building is intact the day after the storm? This statement combined with the earlier stupid statement that they are the only ones that are selling units in Miami makes me believe some idiot at Swire is desperate to sell the units no matter whatever lies it takes. Hmmm. Let’s fact check. First, there are 200+ sky scrapers in Miami. None of them found it necessary to inspect their towers for structural damage following a Cat 1 (or Cat 2) winds. Incorrect amigo. Look at Four Seasons, Panoroma etc. Yes – the ones with the windows missing. But hey, don’t let that get in the way of your inaccuracy. Visual inspections of key structural points are a fundamental part of any recovery assessment be it a building, boat or plane. So…wrong again. Visual Inspection to determine structural integrity! How come I did not think of that? I guess someone else was using the family brain cell.